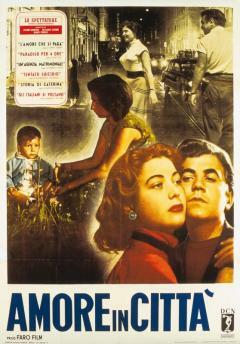 The other film episodes are: L’amore che si paga by Carlo Lizzani, Paradiso per quattro ore by Dino Risi, Tentato Suicidio by Michelangelo Antonioni, Storia di Caterina by Francesco Maselli and Cesare Zavattini, Gli italiani si voltano by Alberto Lattuada. A young journalist is carrying out a survey on marriage agencies. Being sceptical, he pretends to be a customer who is searching for a wife for a rich friend of him. Although he says that his friend suffers from epilepsy, lives in the countryside and he turns into a werewolf during full moon nights, he manages to find a girl willing to marry his friend. She is a sweet and naive girl, who undermines the protagonist’s cynic approach. While Maselli and Zavattini made an attempt at describing a real fact, and other film-makers shot a documentary film, Fellini chose the ‘true-fake’ story. Fellini has never shared Zavattini’s theories on true cinema, as he is convinced everything must be invented. Some people said that Fellini had made a survey at Omega Marriage Agency, and had been assigned the acronym “C. L. 35”. According to others, he had told Zavattini a lie just to make him happy, or to mock the strong advocate of Neorealism. It is most likely that nothing in the Agenzia matrimoniale episode - written with Pinelli - was ‘taken from life’, as Zavattini said. The protagonists are in fact two young professional actors. Antonio Ciffariello (who lends his name and surname to the character of the journalist in an imaginary game of truth) has already performed in some movies and he has started a promising career as an actor. He’d become a popular faces of ‘pink Neorealism’ (…). The role of the girl, Rossana, is played by Livia Venturini, actress and dubber, who’d also perform in La strada (as a nun) and other movies. Of the two ‘tales’ directed by Federico Fellini, Agenzia matrimoniale is the happiest one. It is brisk and witty in the beginning, and then gradually becomes more pathetic, as in description of the clumsy country girl who’s willing to marry a werewolf as she really wants to ‘get married’. This tales summarizes the bitterness and miseries underlying a ‘marriage agency’’ sign. The director actually reaches the goals he had set himself thanks his tact and his attentive observations of the story background and the relevant psychological traits. The outcome is better here than George Cukor‘s Mariti su misura.